If, like us, you have hard time of letting go of old jars, you may find you have unintentionally accumulated quite the collection over the years. So rather than let them gather dust underneath the sink, put them to good use as essential extra storage throughout your home, whether for Lego storage or for storing away jewellery – or for any of these lovely ideas below. If you are dealing with a lack of space in your kitchen, open shelving is perfect for both adding interest and creating a great storage solution for a small kitchen. Try mixing up different sized glass jars and using them to store dry ingredients – arrange them amongst some house plants and some nice crockery and congrats, you’ve mastered the open shelving trend. Even if, like the majority of us, you haven’t been blessed with a huge airy utility room, you can still make your laundry space efficient, functional and good looking. Using bins and jars to store your laundry room paraphernalia is a great way to keep them organised and accessible. These storage boxes from Garden Trading have even been labeled for your convenience. Sure, purely functional items like cotton buds and makeup wipes don’t look all that great when they are wrapped in plastic, but stick them into some pretty glass jars, and you've got yourself a chic display. Not only do glass jars look lovely but they free up valuable cupboard space, making them the perfect small bathroom storage solution. You don’t need tons of space to create a kitchen garden indoors – just an empty shelf or a neglected window ledge. Most herbs are happy in a small container, so a storage jar works perfectly, plus, they look beautiful and make your kitchen smell mouth-wateringly amazing. If you want to bring even more of the outdoors in, storage jars make a great home for small succulents. Try using a wide necked jar, fill it half way with soil and add your plants to create a mini terrarium. Light up your garden by using glass storage jars as candle holders – just drop in some votive candles or fill your jars with a couple of inches of water and float tea lights in them. Try to use different styles of glass and mix large designs with smaller jars, and combine various textures – here seagrass candle holders look great paired with simple glass. If your home office is more of a makeshift nook than a full blown office, then adding extra storage without making the space feel cluttered can be tricky. Enter storage jars. Great for collating all your office bits and bobs in a way that looks great and doesn’t take up a lot of room. We love how blogger It All Started With Paint has organised her desk using mason jars. Looking for garage storage ideas? Why not use storage jars to separate all your DIY paraphernalia? You could simply label the jars and stack them on a shelf, or go even further and wall mount a magnetic knife holder to attach them to. Why spend your hard earned money on beautifully package makeup just to hide it away in drawers? Get them out and on show. Kilner jars are ideal for makeup storage – use small ones to keep your favourite lipsticks accessible and narrow ones to keep your brushes organised. There are few things more pleasing than good shed storage. But if you are finding it hard to face the black hole that has formed at the end of your garden, then start small – sort all the little bits and bobs that have been accumulating in corners and on shelves into storage jars. These Ikea jars come in so many different sizes and are great for storing bits of twine, seeds or labels. Finding a pet food storage container that isn’t an eyesore can be a mission. If you don’t have room to keep your pet food hidden away, or if you want to have it readily accessible, storage jars are a great option. We think these containers from Garden Trading are just too cute to hide away anyway and the neutral colour won’t offend anyone's design sensibilities. 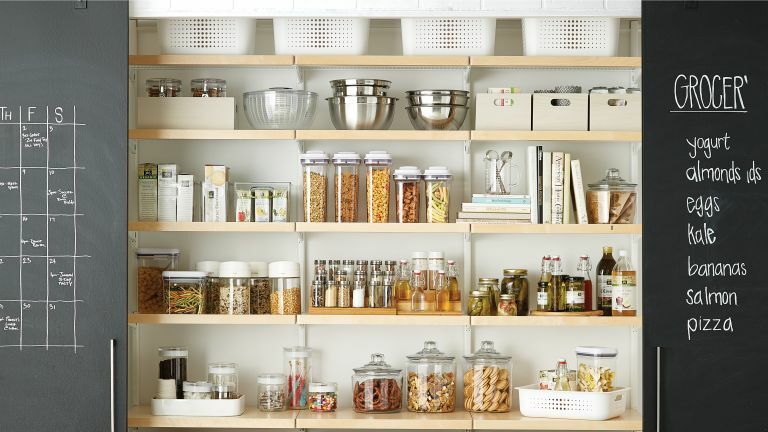 Want more space-saving storage solutions?